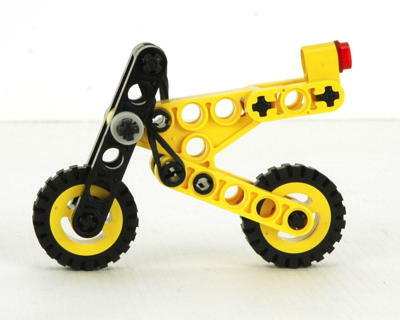 Along with its very similar brother 3054, the 2544 Technic Motorbike is among the very tiniest Technic sets ever made. 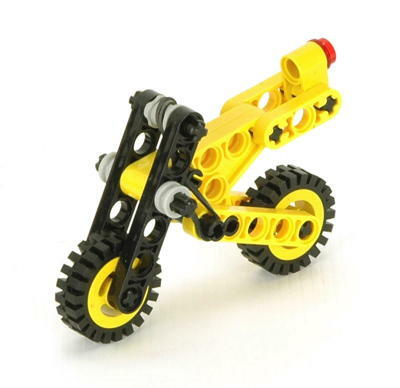 With only 27 parts and 10 studs long, this model isn't exactly packed with functions. However, for the size the functional suspension is rather impressive. This was the first of many micro sized Technic sets released over the next couple of years. This particular model was a promotional item together with Shell petroleum company. This tiny model has two levels of suspension, both supported by a single rubber band. The rear trailing arm is suspended as well as the front fork. The way the front fork rotates back instead of compressing is not at all realistic, but little can be expected in such a small model. 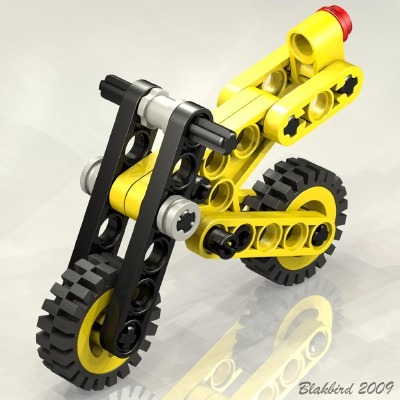 Click for an animation of the front suspension in motion. Click for an animation of the rear suspension in motion.